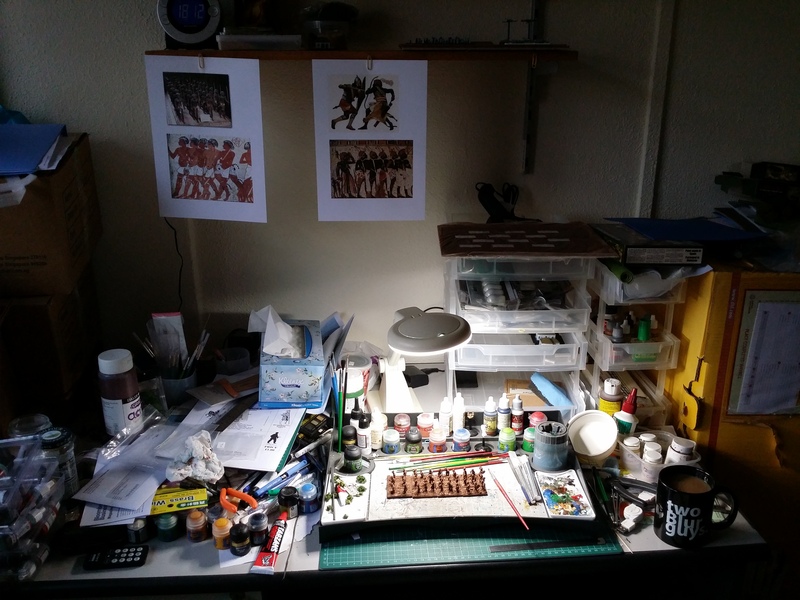 I thought I would start today’s painting update with a shot of Thomo’s Painting area – set in the man cave. I admire deeply all those fellow wargamers who have a neat painting area, with paints all colour coded in special stands. Really, I do admire that. I am a little more laissez faire in my wargames workshop storage skills however. Yep, stuff everywhere but hey, I know where to find everything — even if the lady had to show me where I put my dried grass tufts tonight! On to the painting report. The picture to the right is the current position of the army. After the basing and undercoating yesterday, today I got the bases almost finished. Three dry brushes of increasingly lighter browns has given a good desert appearance, I think. The last colour will be a dry brush of a light grey only to larger rocks. I also tested the skin tones for the Nubians today. I tried a black wash on the brown undercoat and a brown wash. Both left the skin tone a little light for my tastes. I then used some Citadel Scorched Brown (I think that is now called Rhinox Hide) for the base skin tone and tested again with a brown and a black wash. The darker brown with the black wash is the winner in this case, giving a good, dark skin tone for the Nubians, who the ancient Egyptians described as being very dark. Lastly, I thought I would leave you all with a shot of the first three almost finished bases – three bases of Psiloi. 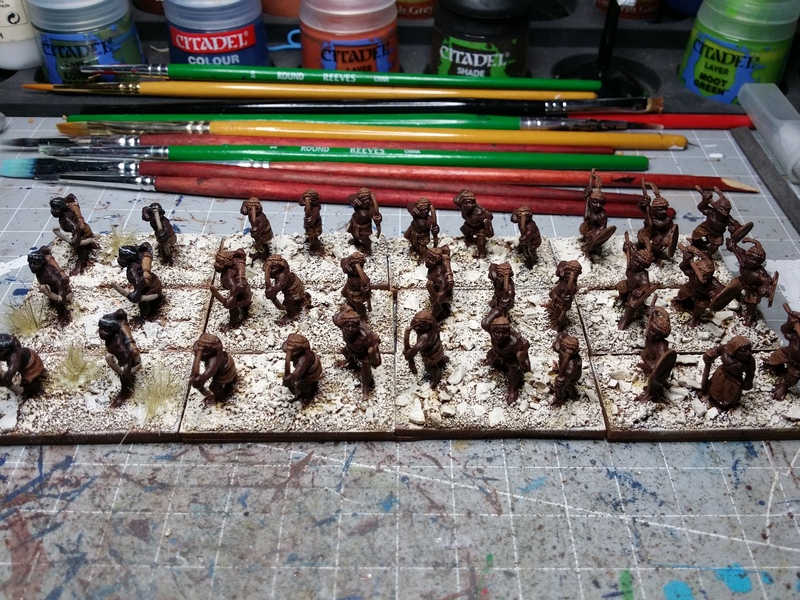 The only thing left to do on these is to touch up the brown around the edge of the bases and then varnish. I’m temped to gloss varnish then matt varnish the figures so that they end up with a nice satin sheen. I’m still; thinking about that. 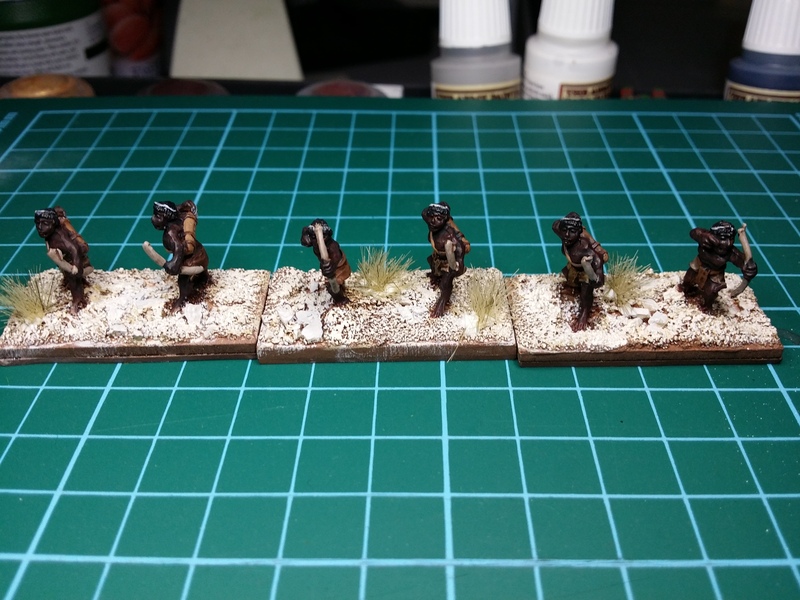 In the meantime, you can get an idea of how my desert bases are going to look now. To sleep, perchance to dream … about leopard skins!